As Autumn hues laden the shores of Rock Lake in Algonquin Provincial Park in Ontario, Canada, a woman enjoys the serenity of the area while canoeing at sunset. During the Autumn, vibrant hues of red, yellow, orange and green decorate the wilderness trees which border Rock Lake in Algonquin Provincial Park in Ontario, Canada. The lake is very calm as a woman spends a few hours canoeing and exploring the area during the lighting at sunset. Rock Lake is paradise for those who love canoeing and hiking, one of the only ways to fully explore Algonquin Provincial Park. Visitors can choose between two campgrounds located along the shores of Rock Lake, both suitable for families and both equipped with beautiful, natural swimming beaches and stunning scenery. During Autumn, the colors explode from the trees, the sunsets are gorgeous and many of the crowds of people have returned to their daily routines, making Rock Lake an excellent place to be one on one with nature. Picture of a woman canoeing in the sunset lighting on Rock Lake in Algonquin Provincial Park, Ontario. 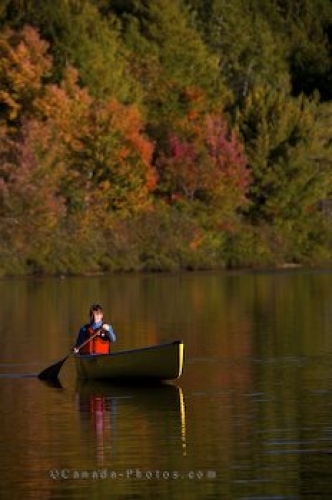 Woman paddling a canoe on Rock Lake at sunset in Algonquin Provincial Park, Ontario, Canada. Model Released.